Below I've collected instructions for how to make laundry soap liquid. Why would you want to make your own laundry soap or detergent, instead of buying some at the store? Well, some of the most common reasons I've heard is that it is environmentally friendly, and also much much cheaper! The main deterrents to making your own though are lack of knowledge of the best recipes, and also fear that it won't work as well. That is where this article is designed to help. A lot of SR101 readers (and reader's from the sister site, Household Management 101), make their own, and have shared their recipes. I've gathered these together to help others find one that works well for them too. Whenever you use your own detergent you need to remember that there is a difference in the amount you should use for HE machines, versus top-loading, non-HE machines. If you use too much soap in an HE machine it will make too much suds and potentially ruin the machine. Therefore, pay attention to the directions below and add as little detergent as possible, upping or lowering the amount until you find the right balance between clean clothes and cost savings by using the least amount needed each time. I've also found that there is no "right" detergent recipe, nor "wrong" one. Instead, many have ingredients in common, but often they have little tweaks to them which people have found work best for them. The beauty is you can tweak the recipes below to work well for your family too, with some trial and error. If you also make your own laundry detergent, but don't see the recipe you use, either liquid or powder, please share it with me here, so I can add it to the site. Now, without further ado, here are the recipes I've gathered from readers for how to make laundry soap. Roxane also shared her laundry detergent recipe on HM101's Facebook wall (and then several others responded, sharing how their recipes varied slightly from Roxane's. Step One: On your stovetop heat 4 cups of water and shave the bar of soap slowly into the water until it is dissolved (keep the water below boiling). Step Two: Add this mixture to three gallons of hot water using your 5 gallon bucket. Step Three: Add the Borax and Washing Soda. Step Four: Let it sit overnight. You can also use 1/4 cup apple cider vinegar (added to the fabric softener dispenser) to rinse water for a squeaky clean wash. Thanks Roxane for sharing how you make laundry soap cheaply. What started this whole conversation on Facebook, by the way, where people started sharing their recipes, was this post about how people need more low cost laundry detergent options. If you're interested in cheap commercial detergent suggestions from readers check out that post for some ideas of what others have shared (scroll down to the comments). If you haven't noticed by now, you will soon, that there are basically three common ingredients in almost all homemade detergent recipes. These are borax, washing soda, and some type of laundry soap bar, which is grated into soap flakes. What makes this detergent so cheap is the fact that all of these ingredients by themselves are also very cheap, and a little of the detergent goes a long way! Below are several more versions of this detergent you can make at home for cleaning your clothes and other washable laundry. Cassie shared her family's variation on Roxane's recipe (see above), for making laundry soap. We use the same recipe as Roxanne except I use two bars of Ivory in place of the Fels-Naptha. I also add a scoop of Oxyclean. We use plain vinegar for the fabric softener. I would say it cost about $4 for each box of Washing Soda and Borax at the Commissary and I buy a big pack of Ivory soap bars for around the same price at the PX. I only need to buy those maybe once a year for our family of 5 that goes through a ton of laundry. Not sure how much we spend on Oxyclean, buy it in bulk at Costco when it goes on sale and we have had it two years so far and still have enough for a few more batches of soap. 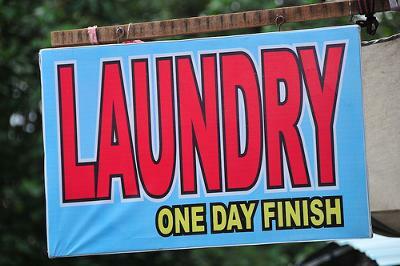 So much cheaper to make our own and our laundry gets just as clean as it did using the store bought stuff. Thanks Cassie for sharing how to make laundry soap for your family. I will share a secret with you -- it is almost always cheaper to buy your main ingredients for your homemade laundry soap at the store rather than online. Although I have some links to various products you can purchase for making these recipes, from my investigation if you can find it at your local store buy it there instead. It will cost less. However, these links can be helpful for people who can't get out to stores, and where their stores don't carry the basic ingredients necessary for making your own. 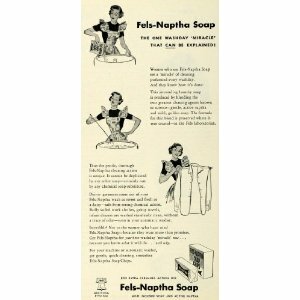 For me, it is hardest to find Fels Naptha soap and washing soda in stores. If the store does stock them, they are typically in the laundry aisle, generally in an out of the way area like the bottom or top shelf. Melody was kind enough to share some additional tips and tricks she's picked up for making liquid laundry soap with me, since she's been doing it for a while. I love hearing these kinds of insider tips, since it really helps us newbies make sure we're doing it right! Thanks, Taylor, for compiling recipes for comparison. I've got a couple of suggestions that may help everyone. 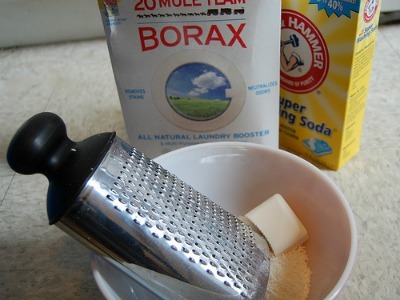 I use a recipe with 1 bar of any soap, 1 cup borax, and 1 cup washing soda. My suggestion is to half the amount of water used, which makes a more concentrated detergent, taking less storage space. Then I only use 1/4 to 1/3 cup in a load. I also suggest using a jug with a spout (like a gallon jug for dispensing punch at a party, or a thermos designated for detergent). Just give it a stir when you use it, or do like my SIL, and drill a hole in the center of the lid to insert a stirring rod. Finally, for anyone who loves their favorite brand's fragrance, it's worth it to make your own, and then add just a cup or more of store bought to the finished detergent for fragrance. Thanks so much for these great ideas and suggestions Melody. I'm sure they're really going to help others make this adventure of creating your own detergent a success. I'd love to hear even more tips from those who've been making these recipes for themselves and their family for a while. If you've got more tips to share you can submit them here, and I'll add them to the page! Lady Sarah shared this recipe on Household Management 101's Facebook page, which is SR101's sister site. I make my own - you need a 5 gallon bucket with a lid. You also need a bar of soap of your choice - I use Ivory - washing soda, and borax. The recipe will vary depending on the type of soap you use - but with Ivory it's 1 bar soap, grated into a pot with 5 cups water, and melted. 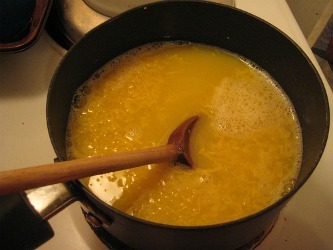 Next, fill a 5 gallon bucket half full with HOT water, add your soap mix, stir really well - then top up bucket with water. Put lid on, let sit overnight to gel. Finally, stir before using - and you use about 1/4 - 1/2 cup per load for regular machines - but start out at 1 tablespoon for HE machines. This is low sudsing, environmentally friendly, and the cost is $2 Canadian per 5 gal bucket. I've used it for months and I love it. I get 400 loads out of a 5 gal bucket. That sounds like a nice cheap way to wash your clothes! I don't think even the cheapest commercial detergents are that inexpensive, at least unless you get it free with coupons or something. Thanks for sharing that recipe! I've noticed many of the recipes below are very similar to this one. I would be interested in hearing from more readers, sharing which laundry bar soap they prefer to use. Some people prefer Ivory, others Fels Naptha soap, others Sunlight, Zote, or Kirks, or maybe even something else. Which do you choose, and why? Directions: Heat 6 cups water, glycerin, oil and grated Fels Naptha in a saucepan over medium heat until soap is melted. Gradually add borax and soda, and stir well. Add the remaining 2 liters of water, and stir again. The detergent will gel and be ready to use in about 24 hours. I store mine in milk or juice jugs, for easy shaking and pouring. Below is a video giving two laundry soap recipes for making your own washing detergent. The video says that these recipes will cost you three cents a load, instead of having to purchase commercial laundry detergent for a higher price. First of all, however, I have to say that I find this video a bit offensive in the sense that it makes it look like saving money by making your own laundry detergent is something only hicks and backward people living in the woods would do. I, on the other hand, believe that as the economy gets tougher and tougher for most people, and also as we learn more about the chemicals in laundry detergents that aren't naturally occurring more and more people will begin to make their own laundry soap. With that preliminary matter out of the way here are the recipes from the video, one for a liquid laundry detergent, and the other for a powdered laundry detergent. You will need to use a stove for making this recipe, and have a heat resistant bucket to stir everything into. You will also need several large containers to hold the laundry soap in after you make it, since it makes over three gallons. After the soap is melted into the hot water boil three more gallons of water and put it in a heat resistant 5 gallon bucket, and then add the soapy water mixture and stir. Next, add the washing soda and stir until dissolved, and then add the borax and stir until it is dissolved too. You will then need a safe place to leave the bucket overnight to let it cook and thicken. Caution: Make sure this bucket is left in a place where pets and children cannot get into it, because it could be a drowning hazard. Then, put the homemade liquid laundry detergent in several containers, such as old liquid laundry detergent jugs, to hold it all. Then, use 1 cup per load of clothes. Combine all these ingredients and mix together. The video also gives a hint about homemade fabric softener, which is to use 1/2 cup baking soda in the rinse cycle to help soften the clothes during the wash. So, do you make your own laundry detergent? 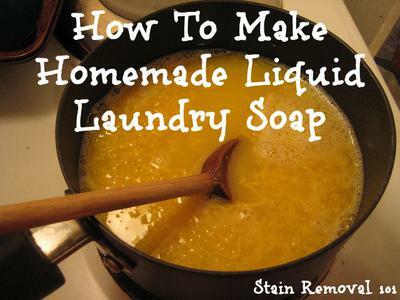 If so, share your homemade laundry soap recipe here, or read other recipes already submitted. You can also see my homemade laundry detergent recipes here. Sara shared her steps for making her own laundry soap, and how it varied from Roxane's recipe (see above). My homemade recipe is similar to Roxanne's but a couple things different. 2/3 cup Fels Napthia grated, 1 cup each washing soda and borax. I put 12 cups water into a large kettle on medium heat and add the grated soap. Heat and stir occasionally until the soap is dissolved. Gradually add the washing soda and borax, stirring after each addition (I usually do about 1/2 cup at a time) until completely dissolved. Pour 8 cups very hot water in your large bucket and add the soap mixture and stir. Add 2 gallons plus 12 cups more water, stir, and let sit for 24 hours. With my front load washer, I use about 1/2 cup per load. In the dryer I use the 60 minute setting and a fragrance free dryer sheet for static. As you can see there are lots of variations for how to make laundry soap liquid, but they are also pretty similar too. I hope these recipes help you out, and that you can feel a bit more adventurous in trying some of them out. For some reason, none of these recipes really mention adding scent to the soap, but you can definitely do this if you like to have some fragrance in your detergent. The easiest way to do this is with essential oils. I've created an article containing suggested essential oils recipes for use with homemade laundry supplies that you can use to get ideas for the most popular scents, and also great ways to blend the scents together. In addition, you can get creative and come up with your own unique signature scent too! If you've used a recipe for homemade laundry detergent or soap and want to share it, I would love to hear from you too! You can share your homemade laundry soap recipe here, or read even more recipes that have already been submitted for even more ideas. It's really not necessary to boil the water. Just use hot tap water. I make mine in a five gallon bucket with a lid. It is basically the same minus the whole stove top thing. When you have the five gallons done, I put one liter of home made soap and one liter of water in a container and shake it each time I use it. I fill up several one liter bottle to have on hand ready to add the water. I wouldn't make my own detergent if I had to boil it. It is a bit tiring to mix. I got an old time laundry tool. You can make you own using a plunger with holes cut in the side. Or You can buy one from Amazon its called a mobile hand washing wand. One bar of Zote soap make 10 gallons of Laundry Soap for $.89. Works great and my allergic friends love it. Try reusing a large sized plastic container that store bought liquid laundry soap comes in. They are compact and have a pour nozzle on them. You could use oil, lavender, patchouli, vanilla or any other fragrance you like. I would imagine you would add it to the water. What do you think? I used liquid castile soap, would this be too sudsy for an HE washer? 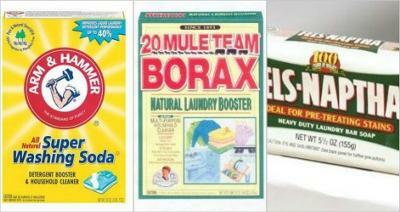 Also I read that borax really isn't great for laundry use. I used my own washing soda and regular soda. Would this be a fair statement about Borax? It needs to be used in warm water in order to work, HE washer use cold water. If you have an Amish grocery store in your area it's a great place to get the ingredients at a much better price. Lowe's sells the 5 gallon buckets and lids also. Or ask an area restaurant. Many restaurant products come in 5 gallon buckets and free is always better! Hi Monika, my family suffers from laundry allergies as well, so I totally understand wanting something you feel will be OK for your child's sensitive skin. I actually have a whole page devoted to this topic at this link for making laundry soap that is unscented. Hope it helps! what about those with sensitive skin? I just want to know how to make my own laundry liquid soap that won't affect my daughters skin issues. That's all. Please help me. I have made my own laundry soap and fabric softener for years. 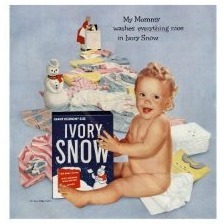 I wouldn't dream of going back to commercial brands. I also make all my household cleaners and several of our personal grooming products. I save money, control what is in the products we use and we're planet friendly ... what a GREAT feeling!!! We made the laundry soap on the stove top and it turned to crystals in the bottom so we could not use it. What did we do wrong? We put the ingredients together and boiled it until it dissolved, then let it cool and it turned into crystals. Homemade soap works great on everything except super sweaty/ stinky lawn mowing clothes. I've made my own no grate liquid for a while now and LOVE it! SO much cheaper! And way too easy NOT to! I switched back to an organic chemical free laundry detergent because my homemade one just wasn't getting clothes clean or whites white even with bleach. Plus it had Borax in it.